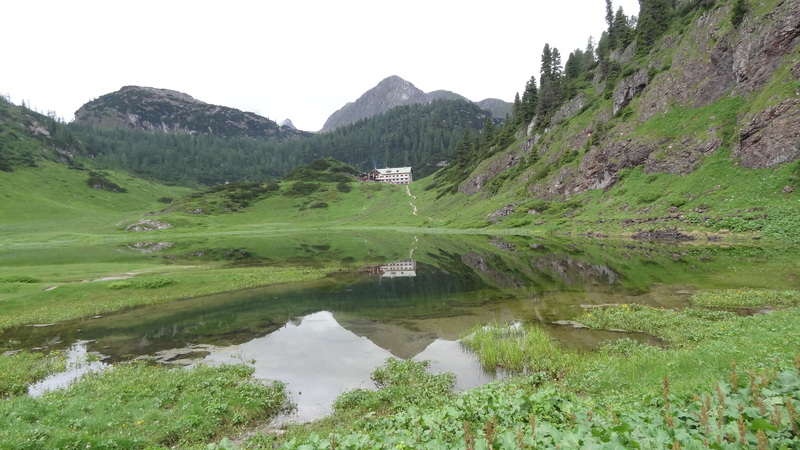 So here we were, sitting in the Riemannhaus hut in the middle of a very bleak looking Stony Sea in the Berchtesgadener Alps, with rain lashing against the windows. 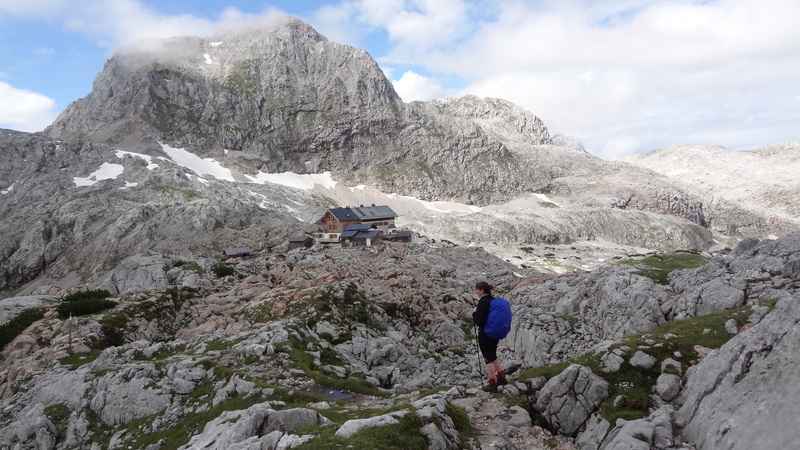 We had a choice now of going out to trek for three to four hours up a snowy gully to reach another hut (the Ingolstaedterhaus), or staying put, getting warm and dry, and staying the night where we were. After debating for a while, we decided that going on was really the only choice. We were there after all, and you have to make the most of it, come what may! After donning some rather damp waterproofs and braving the teeth of the wind, we started out on our way. I am not sure if there was anyone else out there at all, but we perservered, and were so glad that we did. Shortly into the walk it began to snow, which was not quite what we had expected for July, but we were up at about 2,400m, and the clouds were very low. We decided that we would just have fun on the way instead – we were not going to be able to climb anything, it would have been too dangerous. Having a bit of a lark around as the snows came down…. 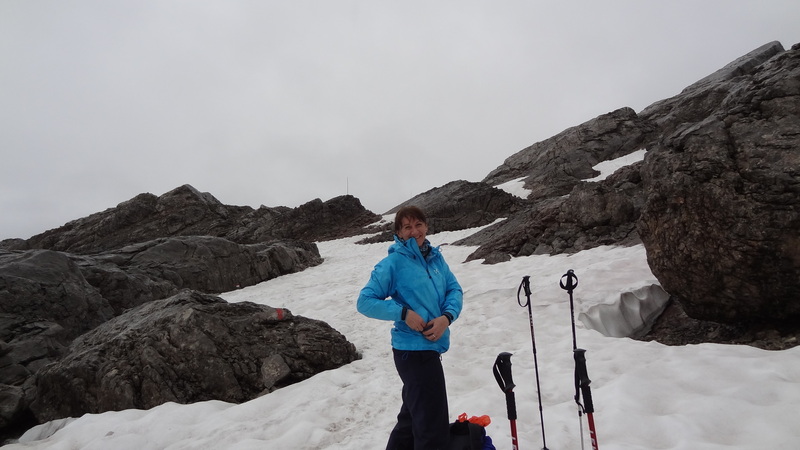 And Anna putting on a very brave and happy face as we headed off up on one of so many snowfields. After a couple of hours of walking, the clouds began to suddenly lift, which was as unexpected as it was welcome. The temperature began to rise and we could actually see ahead of us for a change. It made a big difference to the progress we were able to make. 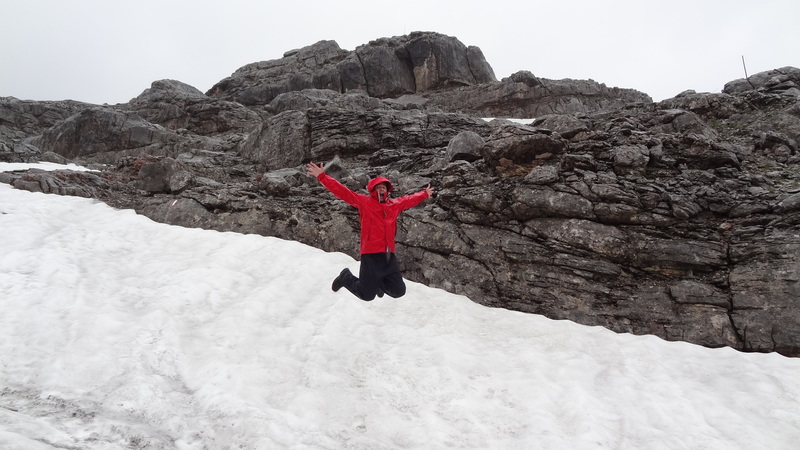 The mood lifts along with the clouds…..
One of the surprising things about this whole trek was just how much snow there was still around. 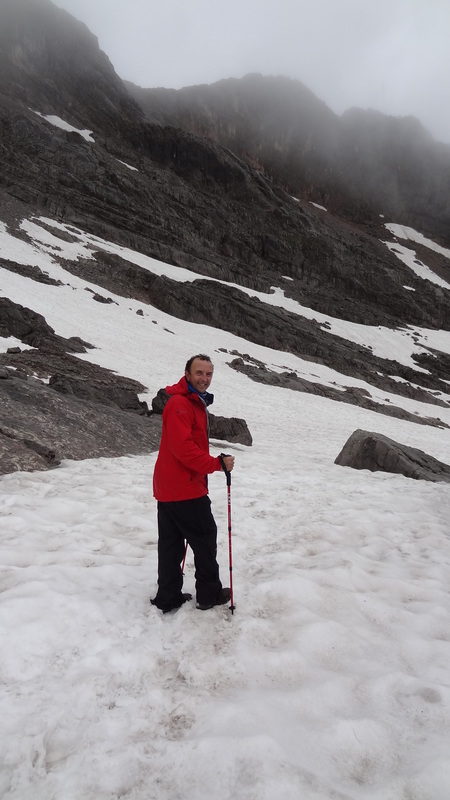 Most of our walking was at between 2,000 and 2,400m, and the snow looked to be a good two metres deep in places. 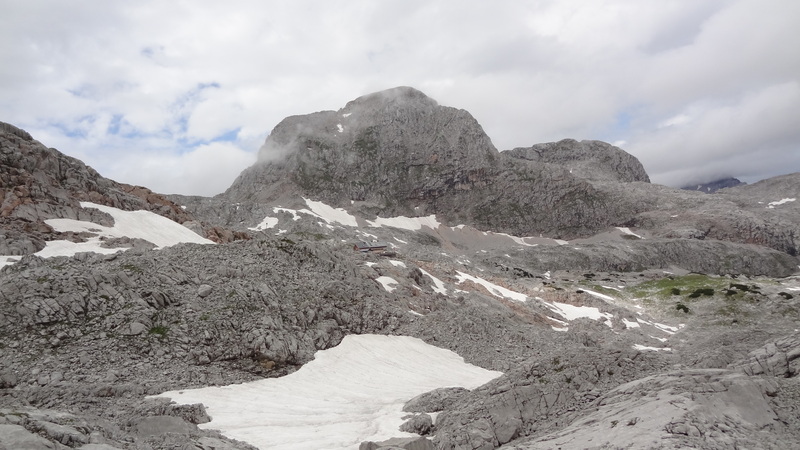 Another snowfield to cross…..the landscape of the Stony Sea finally visible in the background. Eventually the waterproofs came off altogether, and we were able to walk at a much better pace. And finally the Ingolstaedterhaus (centre of picture) comes into view in the distance. The Ingolstaedterhaus seemed to take forever to reach, but was a very welcome sight at what had been along days walking. Had the weather been kinder I would have loved to have climbed up the peak behind the hut, but even though the clouds had lifted by now it was probably a bit of a gamble still, so we got booked into the hut and got our wet stuff off finally. The Ingolstaedterhaus looms ever closer….. The views from the hut were quite stunning now that there was some visibility, and we even managed a beer on the terrace outside – well it would have been rude not to really! After some very suitable Austrian food (Schnitzel followed by Kaiserschmarm, what else?) and a few beers and a glass of wine or three, the end of the evening came rather quickly. The Ingolstaedterhaus was pretty full, and a great place to stop and stay if you are ever in the vicinity. The next morning we had an early start, as we had a lot of miles to cover. 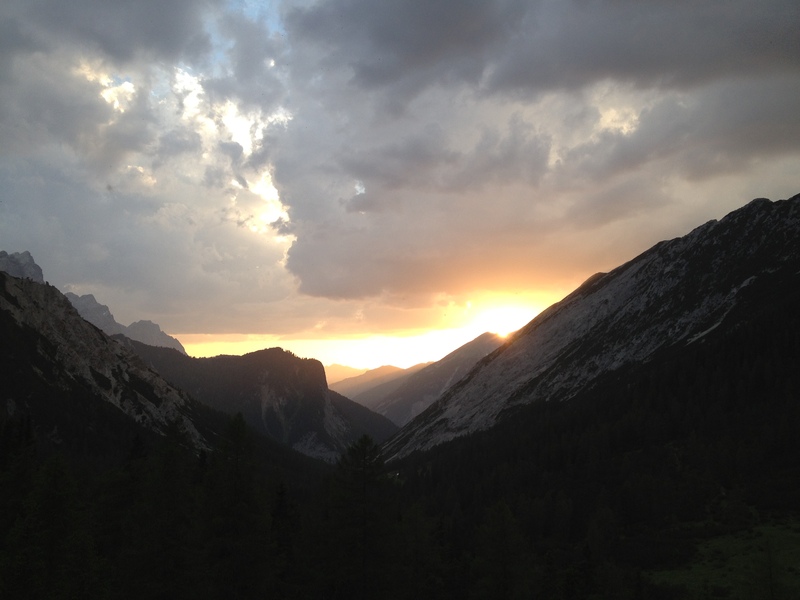 It was our final day in the mountains and had to get back to Munich that night for an early flight back to the UK the day after. 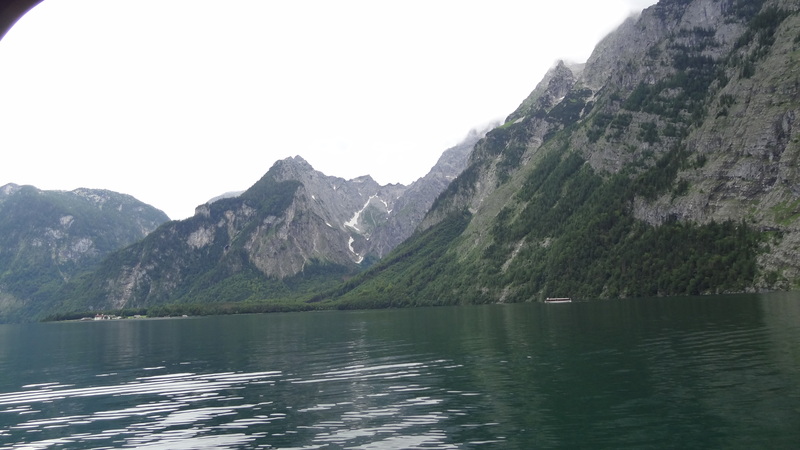 The trek back to the Funtensee was around three hours, and then another three back down to the Königsee in what was one of the heaviest downpours you will ever see. It was a great walk though, and the rain didn’t bother us in the slightest, it was just great to be there. All in all, this (despite the mostly shocking weather) was just a great trip. 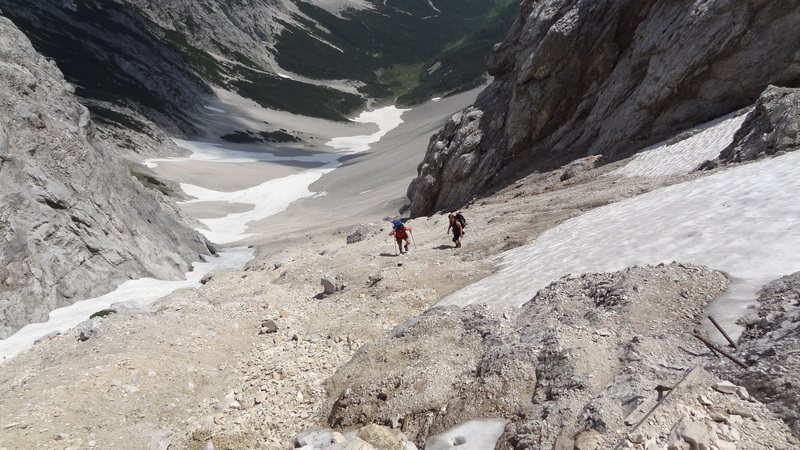 The Bertchesgadener Alps are a stunning location, with a great deal to offer from a trekking and also a climbing perspective, and the Stony Sea is almost like no place I have ever been to. 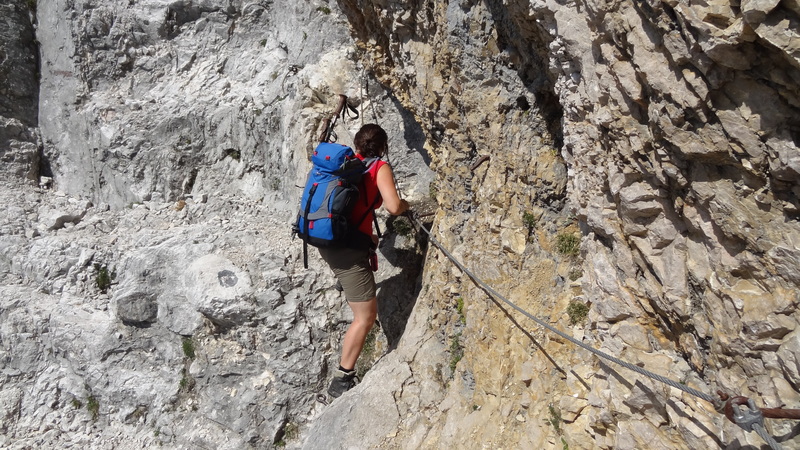 Many of the routes that we passed were graded black and required technical via ferrata equipment, so there is something to offer everyone. 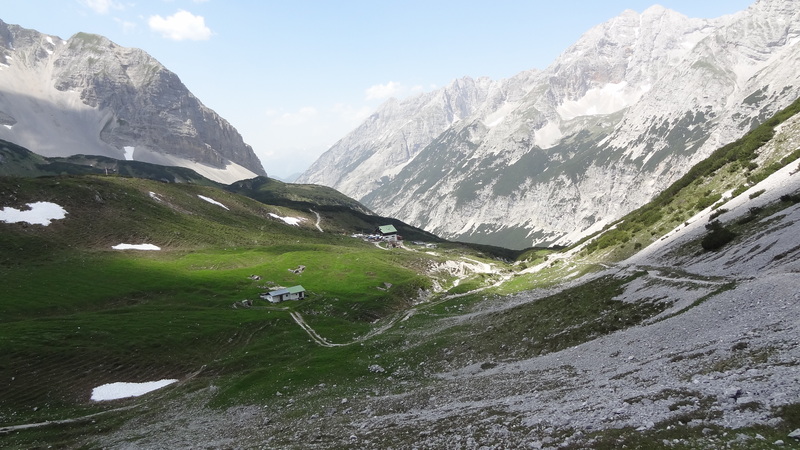 With great huts and fine Austrian hospitality, I’d thoroughly recommend the area, and would love to go back there sometime. 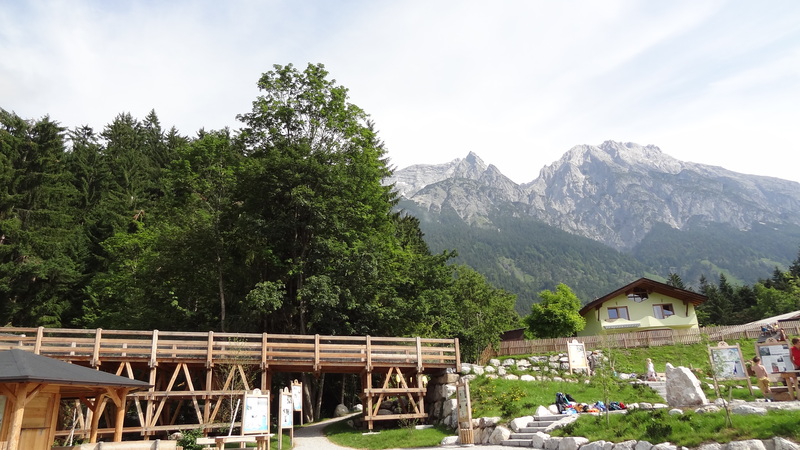 The final day in the mountains saw us waking up in the Pfeishutte in Austria, which is almost due north of Innsbruck. 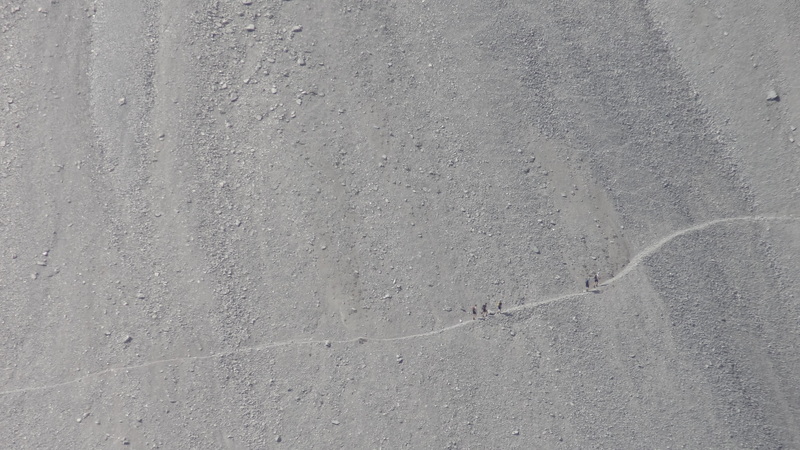 The Pfieshutte sits at about 2,000m, and was very busy. We were in the uppermost dormitory, in a room meant for (I think) 10, and I reckon there were probably 14 in there, which made it a little cosy. 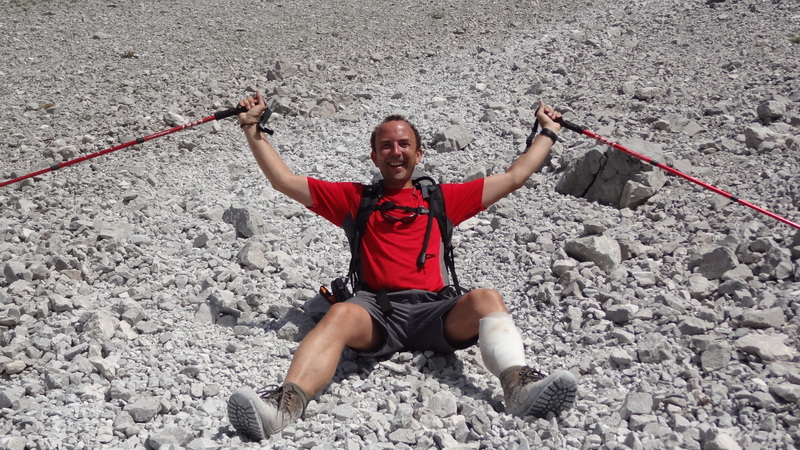 Thankfully I had what approximates to a single bed, the only one I have ever seen in any mountain hut, and since I was waking up with my leg strapped up from yesterday’s fall, I was very grateful to be in it. 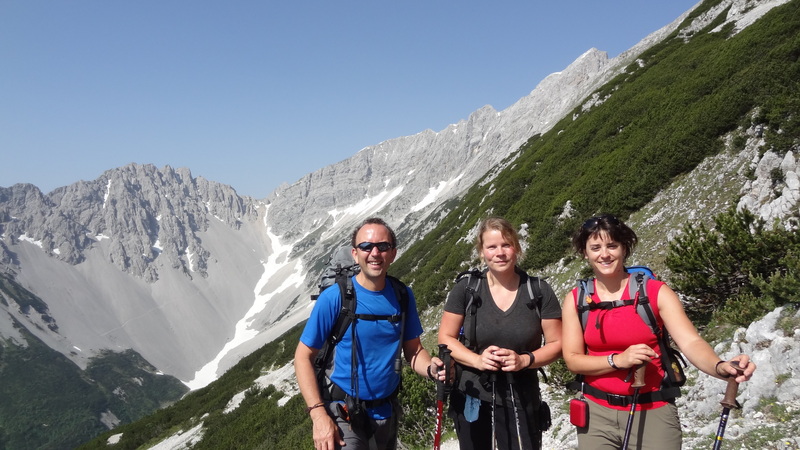 We set out after a very nice breakfast of the usual mountain fare, and headed for a pass which would ultimately take us down a steep scree path, from about 2,250m to the valley floor just outside Innsbruck at around 700m or so. 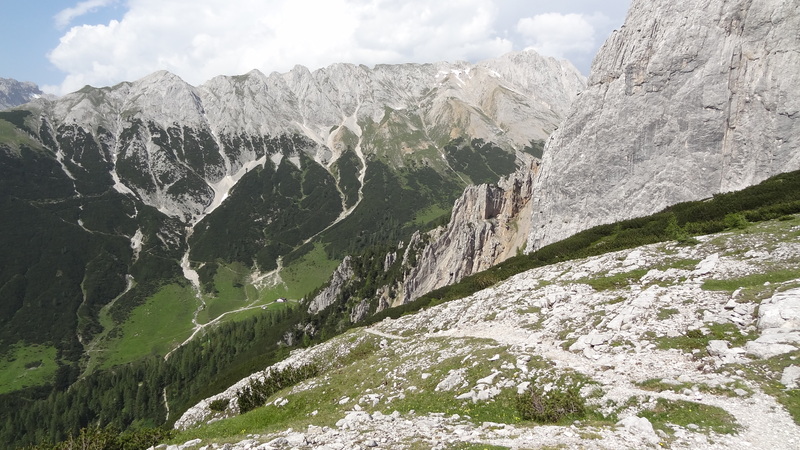 The top of the pass on the Goetheweg trail. Reaching the top of the pass was pretty easy going, despite the heat. 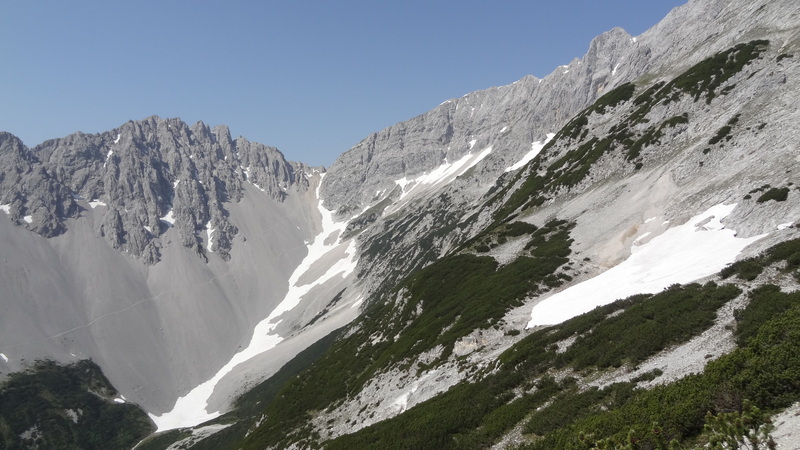 We had heard that the weather forecast for Innsbruck was 37C (99F), which is much hotter than I think they ever get in that part of the world. 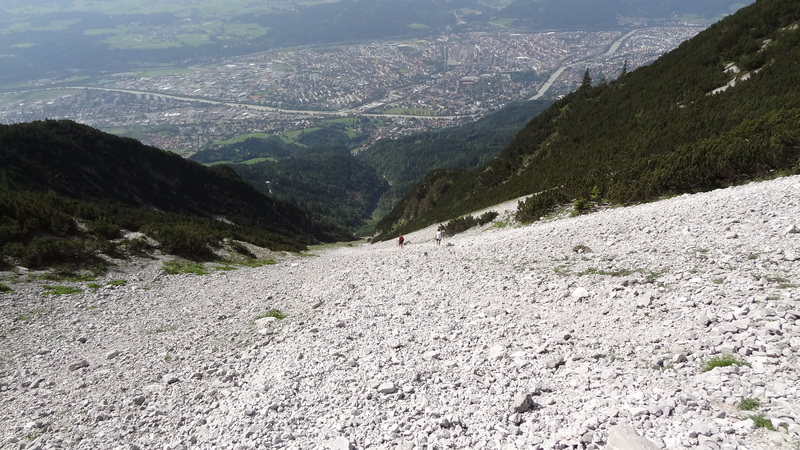 Although we were considerably higher than Innsbruck itself, the temperature was still brutally warm to be doing any kind of physical exercise. 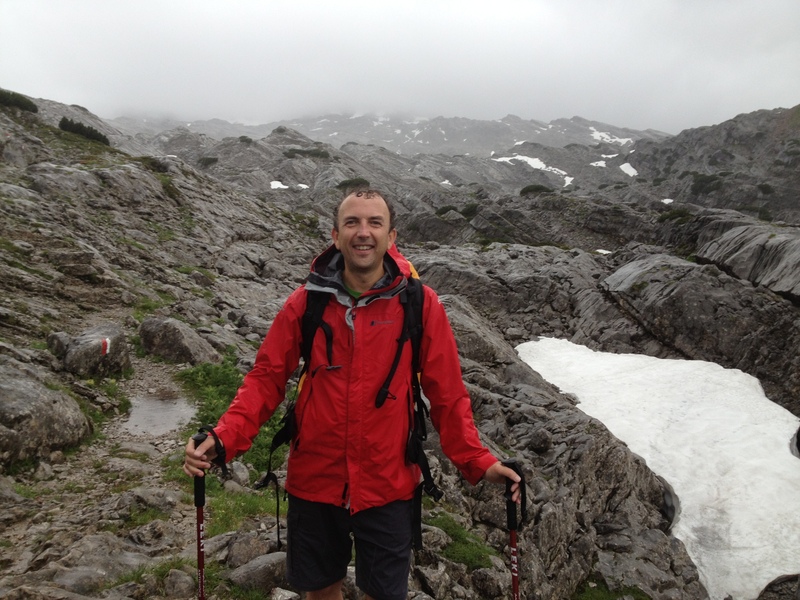 At the top of the pass immediately before the descent to Innsbruck. We then came to the start of the descent. The path was essentially just scree, and very steep. It was hard not to slide on almost every step, which made the heat seem even worse. 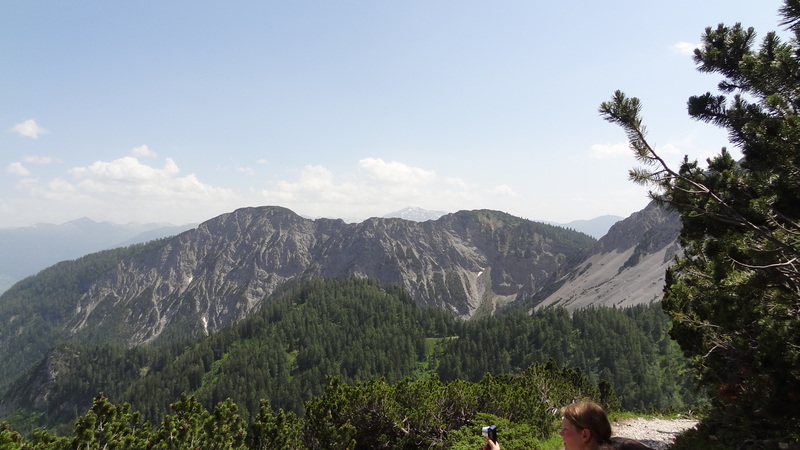 It was also hard not to look at the view of Innsbruck and the Alps south of there, which totally dominated every view. 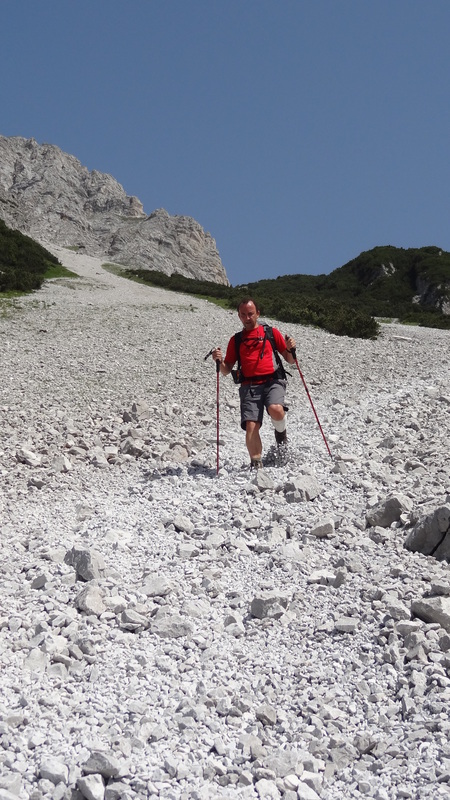 After a while of sort of stumbling down the hill and wondering how long it would take, we were passed at great speed by a couple who were scree-skiing. The penny then dropped that this was really about the only way to get down, and certainly quicker, and probably just as safe, so we went for it. 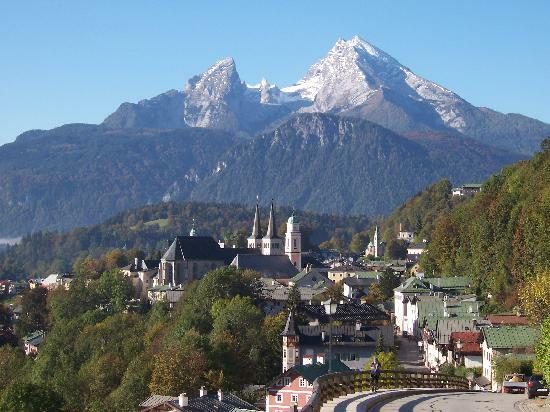 …..which brought Innsbruck ever closer……. When we got down to about 1,200m or so, there was a very welcome hut called the Rumer Alm, where we stopped for lunch and a drink. the temperature by now was really hot, even in the shade, but the break was very welcome nonethless. 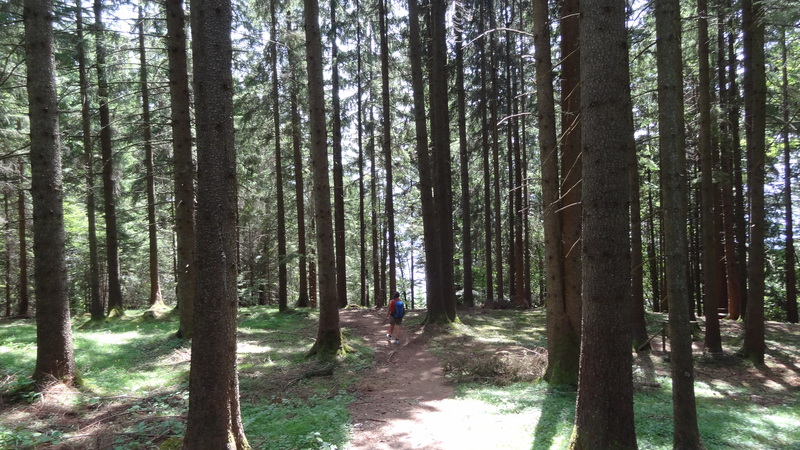 The walk down from the hut to Rum itself (a suburb of northern Innsbruck) was about a further hour, and was basically a beautiful walk through a stunning pine forest. From here after the bus we returned to Achensee on the way back (and the World Cup final in an Italian Bar full of very miserable Italians by the end of the night!) before returning to Munich for the flight back to the UK. 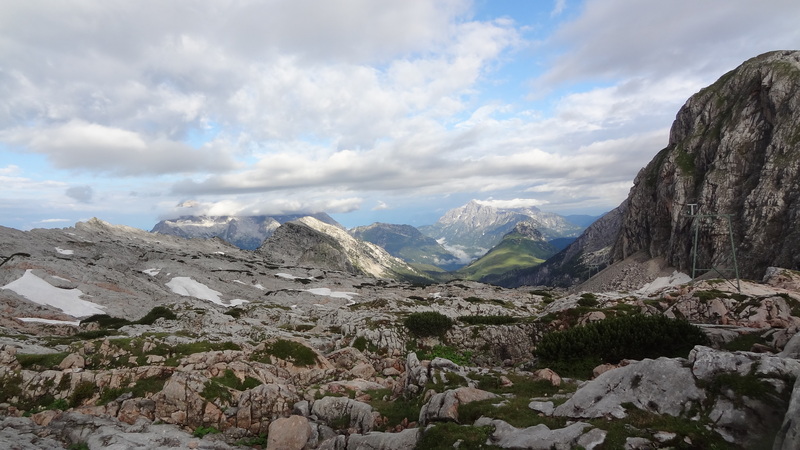 The Karwendel Alps had been great. 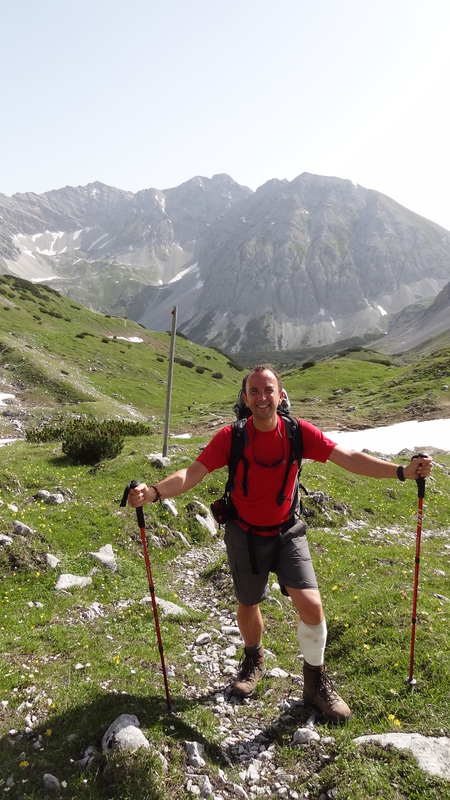 Considering I had never even heard of the region itself only a week before going, it had been a real surprise in terms of what it had to offer, including the diversity (and difficulty) of terrain, the beauty of the mountains themselves, and the hospitality and friendliness of the Austrian people. Blessed also with wonderful weather, great company, fine food, and some very fine mountain huts, it made the trip hugely enjoyable. I resolved that it should not be long before I returned to the region, something that as it turned out would be a lot more prophetic, and indeed imminent, than it first appeared……..
Waking up in a 10 foot by 10 foot room in a mountain hut with 10 people in it, all laid out like sardines in a tin, is never the best recipe for a good night’s sleep. 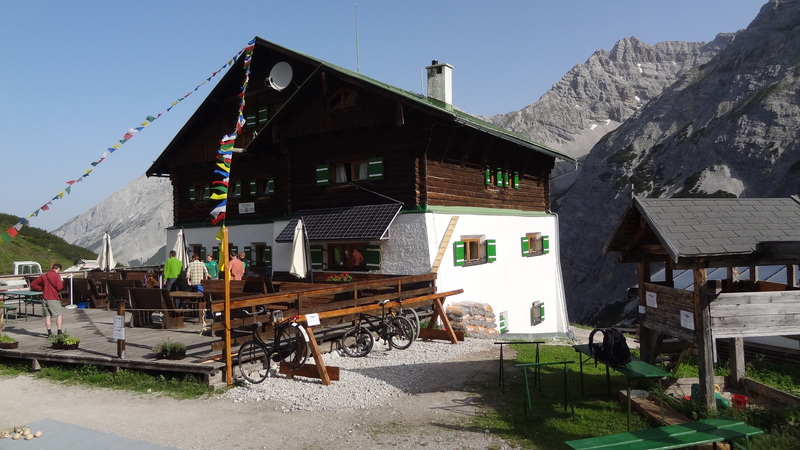 And so at 5.48am I woke up for the sixth and final time this morning in the Hallerangerhaus hut in the Austrian Karwendel Alps. 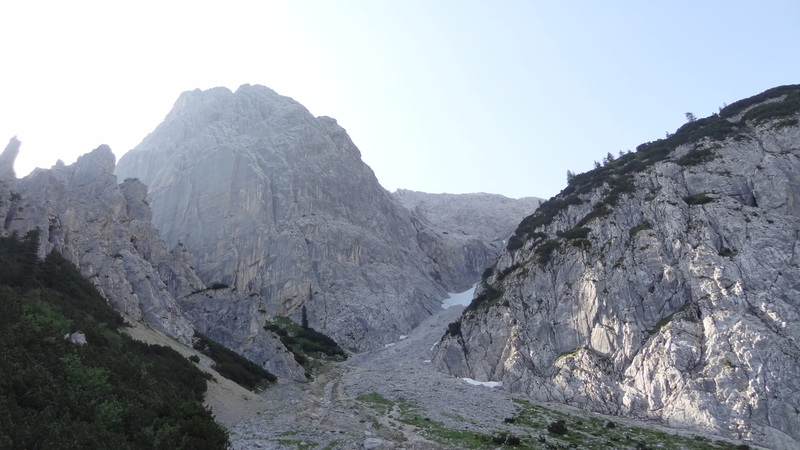 The area is nothing short of outstandingly beautiful, with some soaring and scary cliffs around us (graded 9+ in the German scale, which I think is 5.13c or so on the US rankings ). and bread with honey and jam to get us back up the mountain from where we had descended the day before. We should head up there somewhere……. A beautiful day awaited us as we set out. 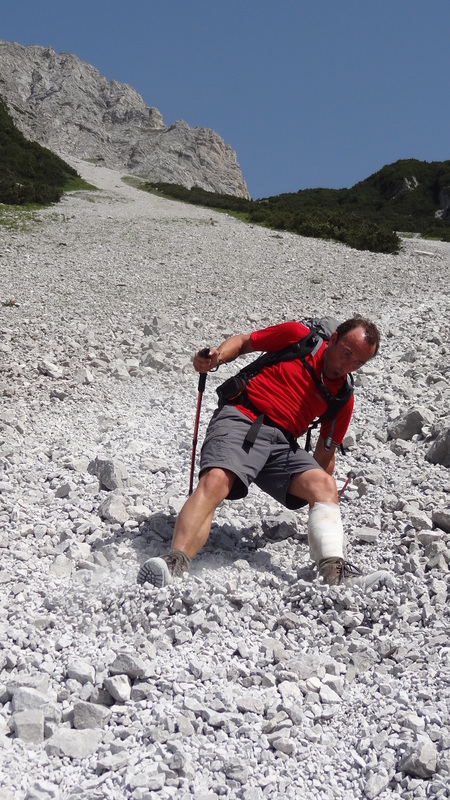 Once over the top, that path was a beautiful traverse, called the Wilde Bande Steig. 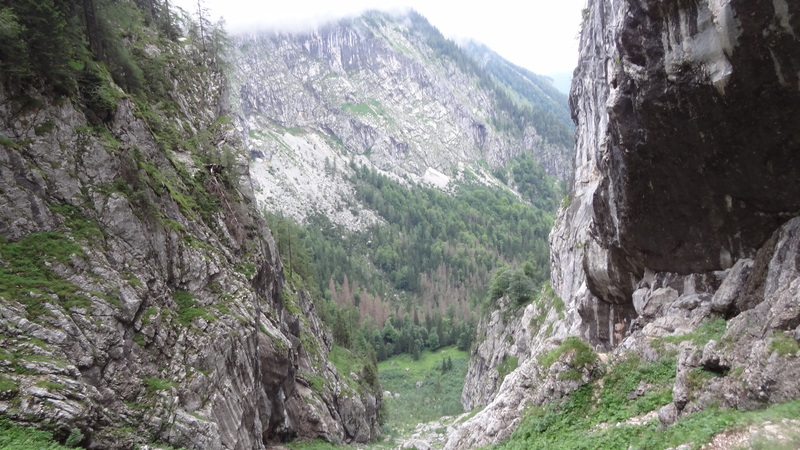 It was a scramble in parts, and sometimes was secured by small sections of via ferrata, but no clipping in was required. 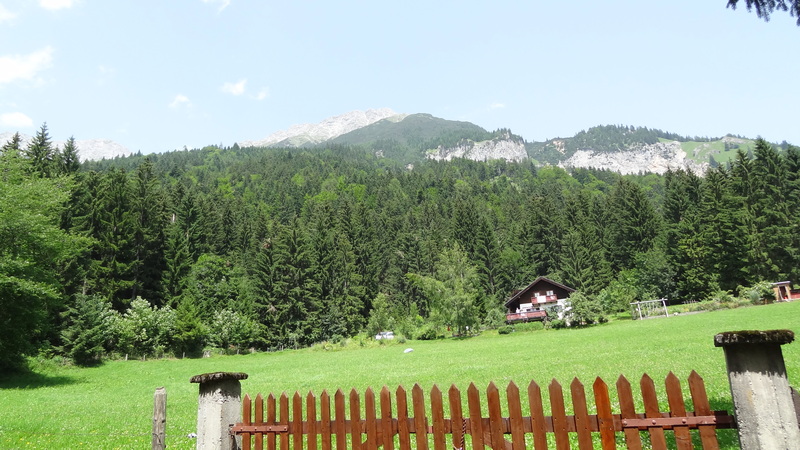 About to set off along the Wilde Bande Steig – our path would take us up the snowy col in the distance eventually. 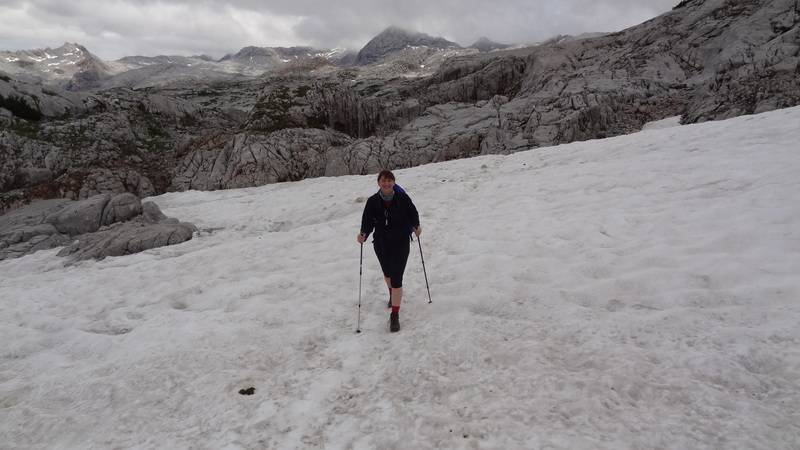 A couple of snowfields had to be crossed, but the snow was firm but yielding and so did not require crampons, which was a relief as I had left mine at the bottom of the mountain! 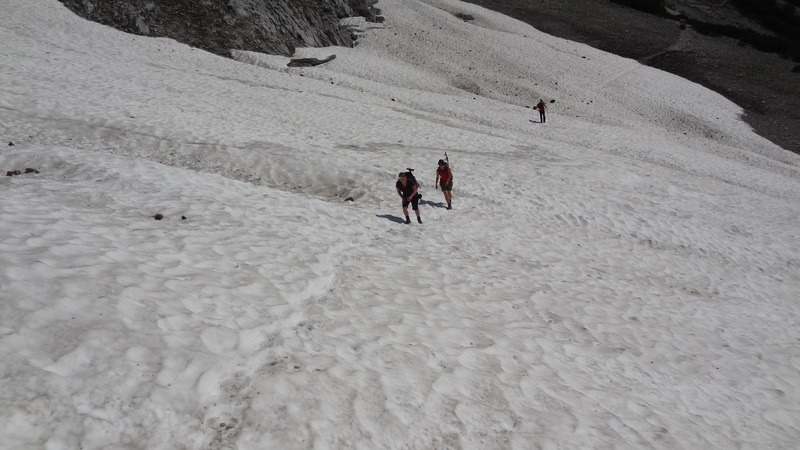 After crossing a final precariously perched snowfield, we began the climb up to the col, the Stempeljoch. The path was very steep and it was by now extremely hot, and virtually windless, but otherwise wasn’t too bad. Once over the top of the Stempeljoch we climbed up to get a view back over the ridge back down the valley. It was a beautiful view. When I took the photo below however I then stupidly stepped backwards into thin air and fell, landing onto my shin. Although it was only a short fall, my shin bled profusely (high pulse/blood pressure at the top of the climb no doubt contributing to this) and it looked a lot worse than it ultimately was. I bled a lot for this photograph 🙂 The view behind shows part of the path that we used to ascend. From here we thankfully had only a shortish walk to the next hut, the Pfeishutte. We went down straight away so that I could get my lep patched and cleaned up. The people at the hut (and I should most certainly say the same for both Susanne and Verena too) were fantastic, and I’m very grateful to them. Although my cuts weren’t ultimately too bad, they were very all very diligent, and it made me realise that if things had been worse (I could, and probably should, have fallen further than I did) then I was in safe hands. The path down to the Pfeishutte, shown in the middle of the picture. Duly bandaged up, the staff at the hut told me that I should put my feet up for the afternoon, and never one to look a gift horse in the mouth, I did :). 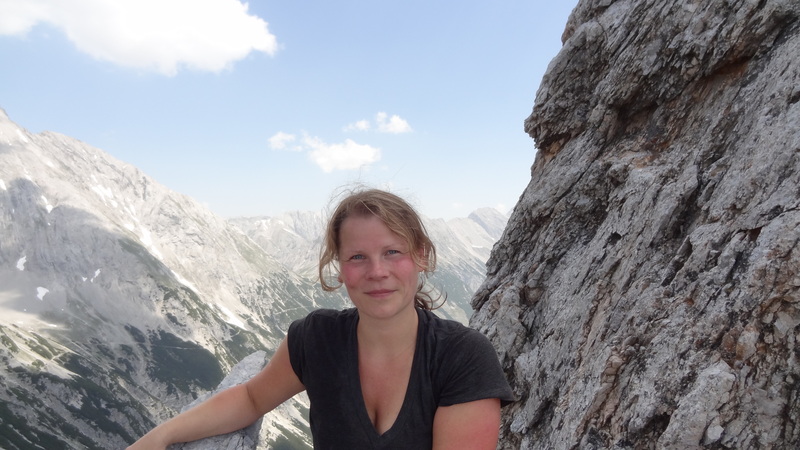 I did then feel rather sorry for Verena and Susanne, as had it not been for my fall (or stupidity, or both) then we would and should have gone on to do a summit that afternoon, but instead they looked after me and took me down. 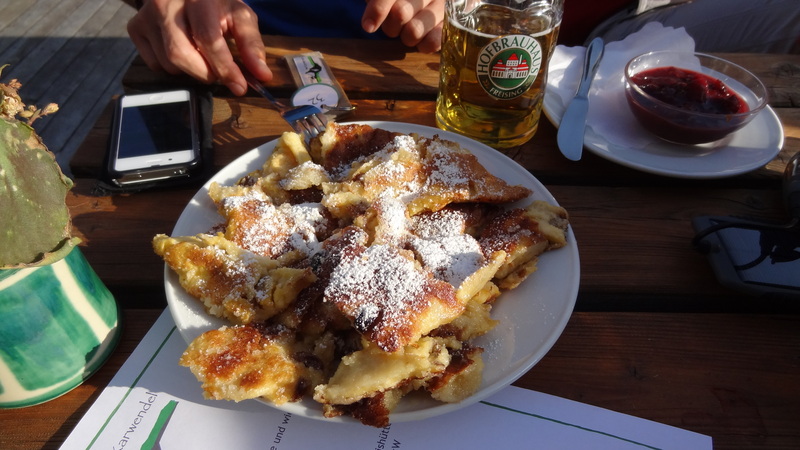 Kaiserschmarm – food of the gods! The Pfeishutte was packed to the rafters, but thankfully we had places to sleep having rang ahead the day before. 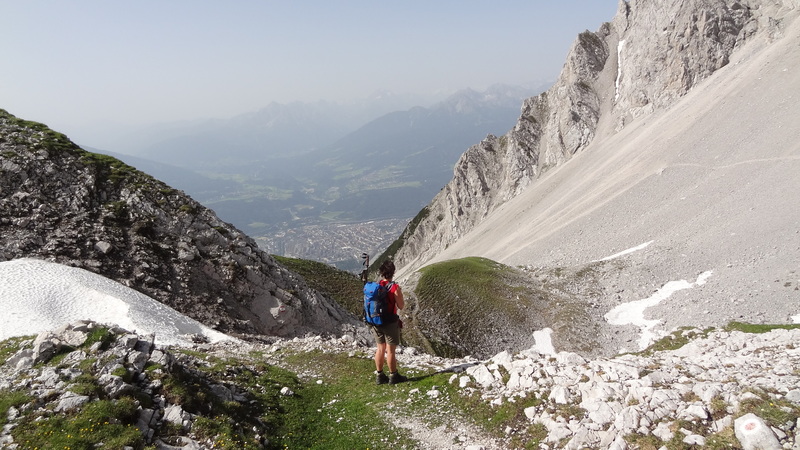 In the morning we would start our descent from the mountains in the direction of Innsbruck, on what sounded a potentially steep section of scree – it sounded great. Waking up in strange surroundings I should get used to, but somehow I never do. Today was certainly no exception. 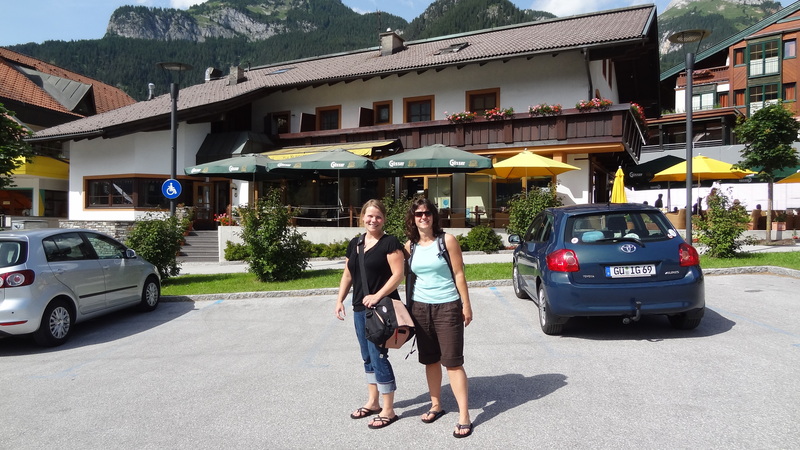 We (Verena, Susanne and I) were in the Klingler Hotel in Maurach, Austria, and I woke to find rain and wind and also feeling quite disorientated. We had expected the weather to be outstanding this morning. 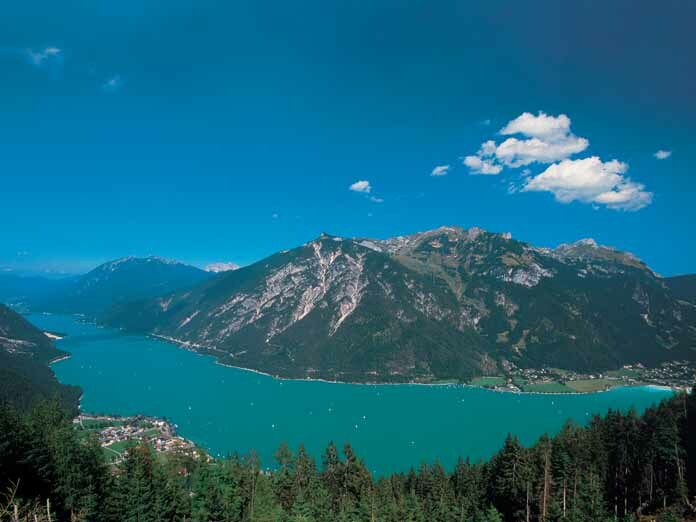 In fact the forecast for Innsbruck, the nearest place to where we were headed, was for cloudless skies and 33 C. The rain (and it was tanking it down) therefore was rather unwelcome to say the least. It was also distinctly chilly. Breakfast was however wonderful, and afterwards we set out with rather mixed feelings about what the day would bring. We needn’t have worried however, and within about 10 minutes of setting off for our destination (only 30 minutes away), we were in bright and beautiful sunshine. 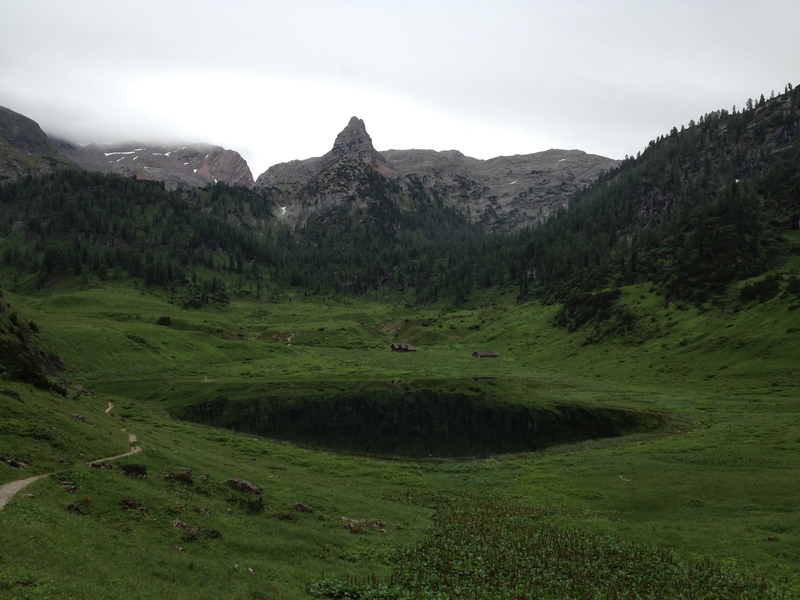 Then however after arriving in Absam, just east of Innsbruck, we hit our first snag. 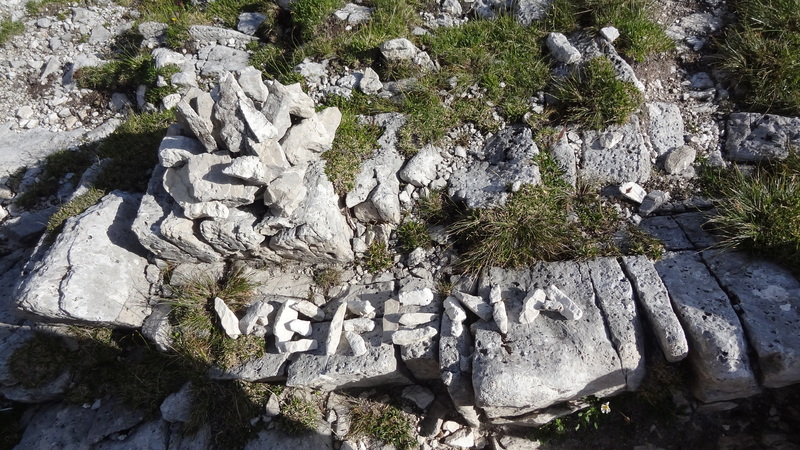 We were looking to park, nicely mapped out by Verena, at a place called St Magdalena, at about 1,300m. 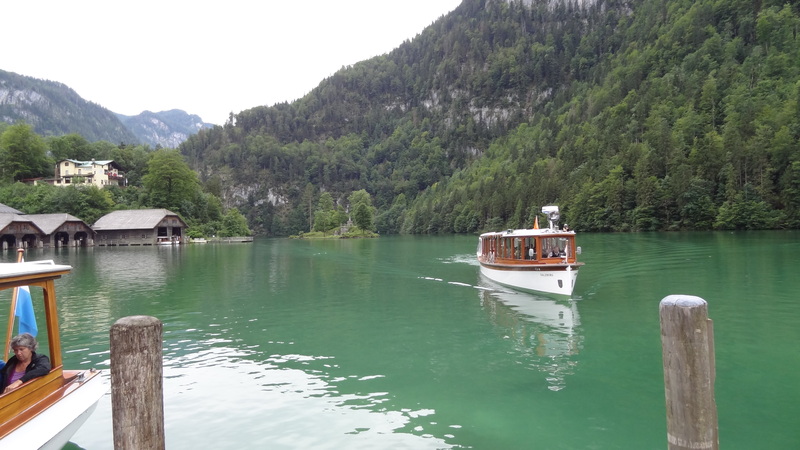 This would let us get to our planned destination (and accommodation for the night) the Bettelwurfhutte. 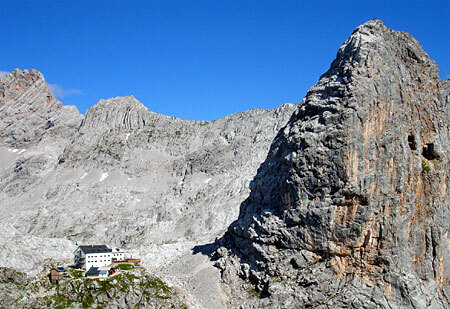 The Bettelwurfhutte was at about 2,100m, and would allow us hopefully to a scale a peak or two after lunch. 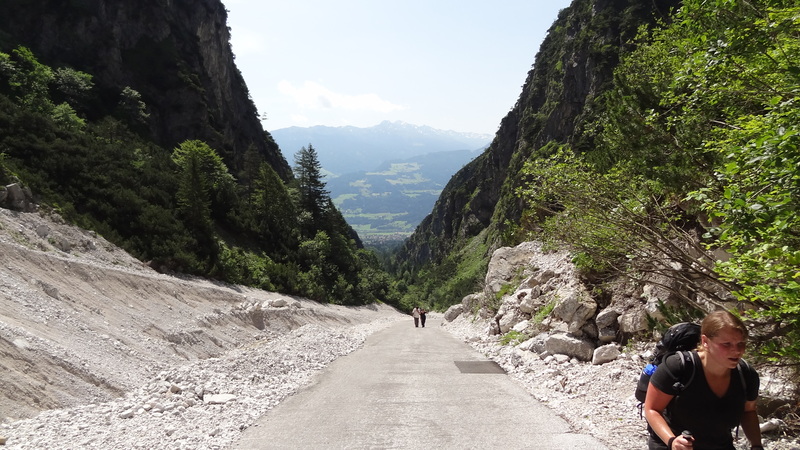 However, upon coming to a dead end half way to St Magdalena and enquiring of a very helpful local lady (in fact everyone in Austria throughout was just so friendly and helpful) she told us that this was the furthest we could go. 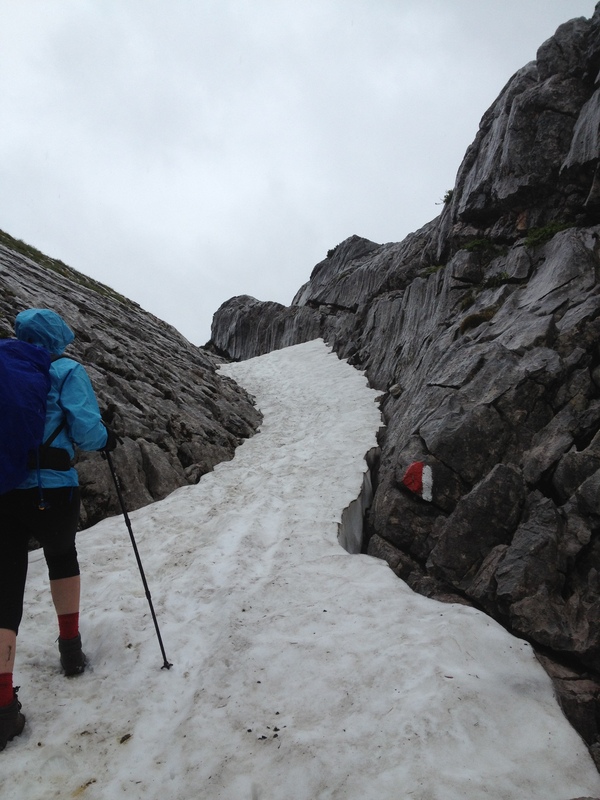 This was not good, as we were barely at 700m, leaving us with the thought of 1,400m of ascent before lunch, which was a tall order at best. 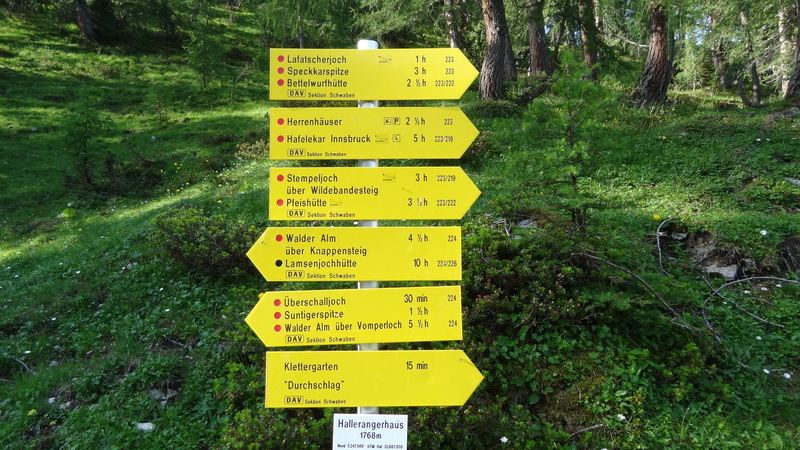 We then thought we should ring the Bettelwurfhutte to tell them of our arrival and to book our accommodation in case things were busy. Susanne looked somewhat shocked to be told that there was nothing at all to be had. The place was literally crammed full. Ringing ahead to hopefully get us some beds for the night. We then spent a further 30 minutes or so (rightfully) trying to contact other huts to see if we could get other accommodation. The long and short of it was that everywhere seemed to be either full or on an answer machine. In the end we just decided to go for it. There was another hut apparently a further two hours or so from where we planned to head, although we couldn’t reach that one by phone either, but to delay the trip further (it was already 10.30am with perhaps six or more hours walking ahead of us) would have wasted too much time. Within probably 20 minutes or so of walking up a steep road, just to reach the start of the trail, the heat was really taking its toll. The forecast temperatures for the day would prove to be correct and the sun beat down relentlessly from here on. 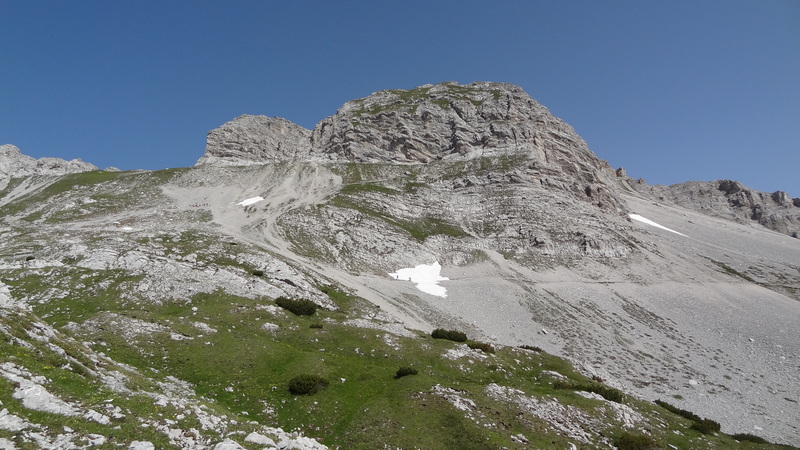 After an hour or so, we reached a path which would lead us to the original destination (the Bettelwurfhutte). There were three paths in total. 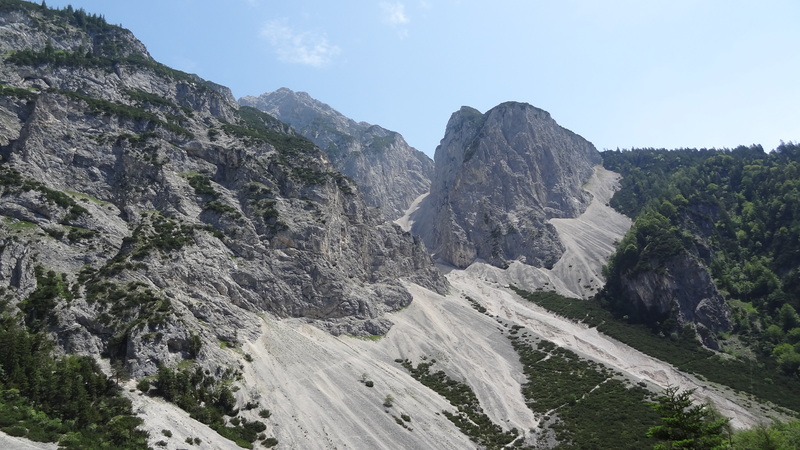 One of them was labelled ‘Klettersteig’, which was out for us as we did not have harnesses or via ferrata equipment with us. 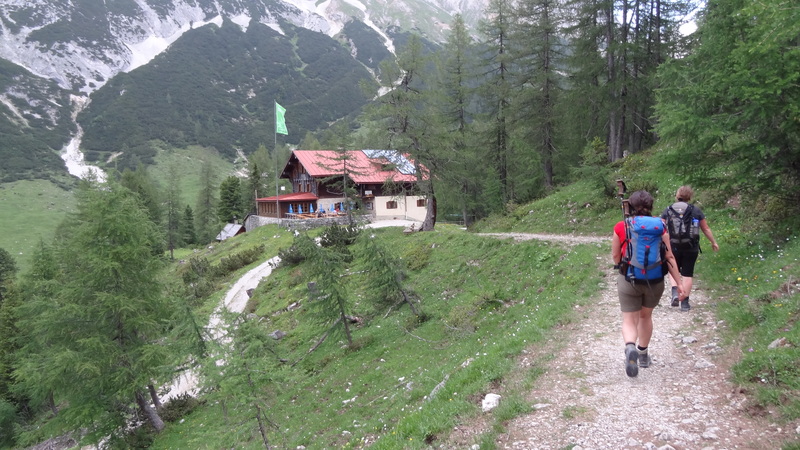 The other two paths looked long, and as we did not think we could get accommodation at this hut anyway, and after Verena and Susanne took the advice of a very helpful local passing shepherd, we decided not to take this route. We duly marched on headed for the other hut, the Hallerangerhaus., which from our our current position was apparently a further 3 and a half hours. That may have been true for a fit Austrian (for whom the signboards must have been made) on a coolish summers day. This however was sweltering, and I couldn’t walk for more than about 50 paces uphill without stopping to wipe sweat from my brow and catch my breath. It was simply draining. 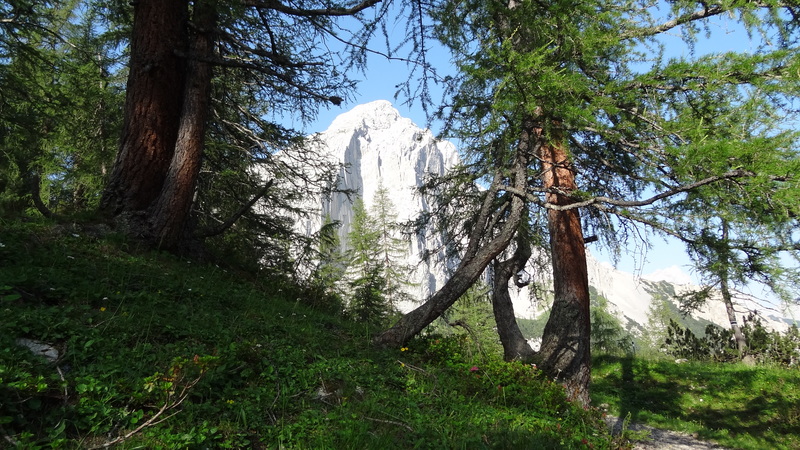 An alpine meadow looking in the direction of the Stempeljoch, which would be tomorrow’s destination. 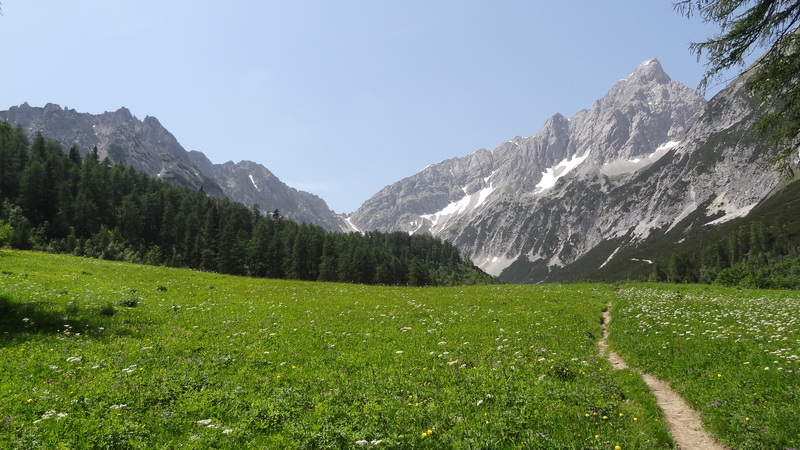 From alpine meadows with beautiful tiny flowers, to hillsides scattered with Edelweiss, to towering peaks around 2,000m above the valley floor, the Karwandel Alps were certainly proving to be everything I hoped they’d be and more. The walk ultimately took us around 6 and a half hours. This meant that there was no time for other peaks along the way, but this in no way detracted from the day. Ultimately it was too hot anyway for serious hill climbing. 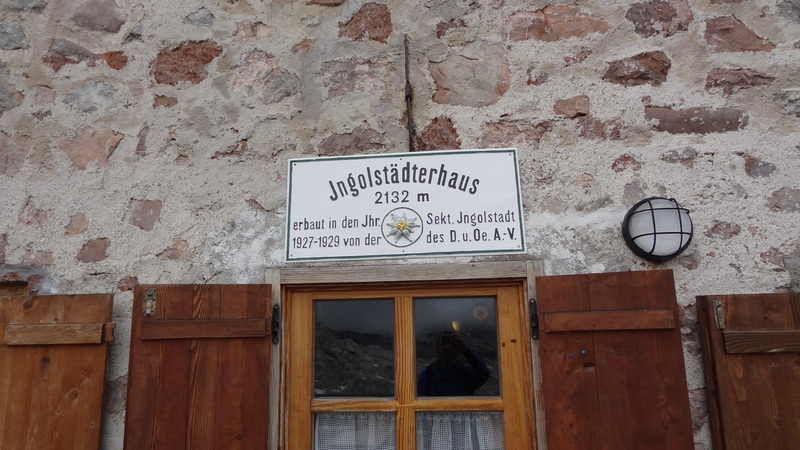 Even when we reached our resting place for the day, the Hallerangerhaus hut, the temperature was 28 degrees C, and this at 1800m. And a closer look at the Hallerangerhaus, our destination for the night. Dinner was a perfectly cooked Vienna Schnitzel (well we were in Austria after all) washed down with a few glasses of Austrian beer. From the terrace of the mountain hut (we literally sat outside all evening it was so warm) we saw an amazingly beautiful sunset, and were entertained by the local hutkeeper and his wife. The hut was completely full, and we were ultimately lucky to get a place for the night at all. In the morning we would climb back up the hill we had just descended and head to the Pfeishutte. We had seen glimpses of the path we would go on on the way today, and it looked great. This trip was already going too quickly!